One of most exciting players at the Adidas Next Generation Tournament in Coin, Malaga was just a reserve. His name is Amar Sylla and he is a 2001-born forward with Real Madrid. He was born in Senegal and flashed an impressive skillset. Sylla used his chances excellently in Coin, averaging 6 points, 2.5 rebounds, 1.0 assists, 1.5 steals and 1.3 blocks in just 8:08 minutes per game. His best game came against Bayern Munich as he collected 11 points, 9 rebounds, 4 assists, 5 steals and 5 blocks in 17:24 minutes. 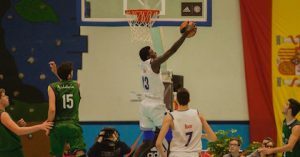 Sylla also played for Real Madrid at the recent 2017 U16 Szent Istvan Cup in Hungary and he averaged 10.3 points, 7.3 rebounds, 0.7 assists, 1.3 steals and 2.8 blocks in 20.7 minutes for title-winning team.